The BC-SRD is a unique audio system that was developed in cooroperation with Germany's largest television station, ZDF. 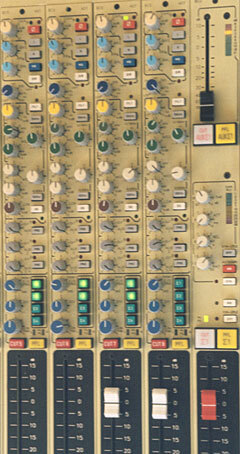 The BC-SRD console has three possible modes of operation: Mono, Stereo and Surround. 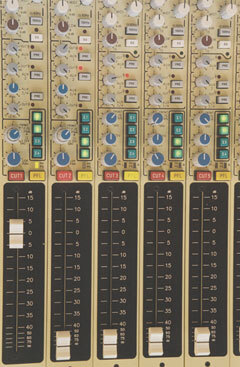 Four group rails allow configurations of 4 mono masters, 2 stereo masters or one 4 channel master. In addition, there are 4 mono auxilliaries. This transfer console has balanced circuitry and is fully shielded from electrical intereferences throughout. All inputs are outputs are transformer balanced using Haufe made, oversized, torodial transformers of the highest quality. A minimum of one monitor unit BC-A, the electoral unit BC-W and 4 group units BC-G are required in every BC-SRD transfer console. The absolute required amount of input modules BC-I or BC-S depends on the application. The mono and stereo channels are compatible and interchangeable. Various standard frame sizes and versions as well as custom frames are available. The dimensions of all the modules in the series are 445 x 40.6 mm. Power supplies and relay units are supplied in separate 19" units. With a standard frame, these units can be accomodated in the mixing desk's stand. This a completely modular system, therefore, the size and arrangement of the mixer is custom assembled in accordance with your requirements. The frame size, the number and types of the installed modules are all determined by your requirements. Even special, custom color schemes are accomodated. Level meters as well as patch bays and/or crossbar distributors can be installed into the console's bridge.